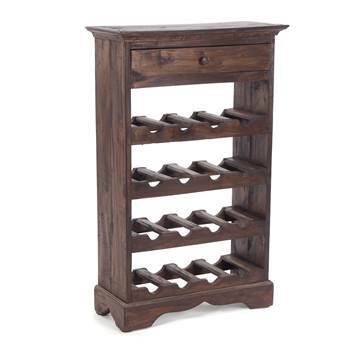 Mahogany wine rack for up to 16 wine bottles with practical work area / shelf for bottles and glasses and a drawer for all necessary barware. The elegant design of the bottle rack fits well in the dining and living area. Measurements (approx. ): Height: 33.5", Width: 21.5", Depth: 9"